Kyle Edwards is Anishinaabe from Lake Manitoba First Nation and recently graduated from Ryerson School of Journalism. He is a writer for Maclean’s magazine in Toronto and was nominated for a National Magazine Award in 2017. It’s a cool October morning and the field just outside Tsha’ Thoñ’nhes on the Onondaga Nation in Upstate New York is damp and green. It smells of rain from the night before, and the grey clouds above might bring more. The Earth rumbles as dozens of young boys sprint back and forth, many of them with long, dark braids swaying beneath their lacrosse helmets, to determine who’s the fastest. The boys, each carrying a lacrosse stick, break into drills led by professional lacrosse players from the community. Lyle Thompson, one of the athletes running the camp, coaches a small group in the centre of the field. “We’ve got to learn from each other,” he says to them. One by one, the young players charge the net, juking and pivoting past Thompson before cocking their sticks and quickly whipping the ball past the posts. “This is medicine,” says a woman in the crowd of parents off to the side, all of them looking on in pride. More than 300 young lacrosse players are here for the Thompson Brothers Lacrosse camp, part of a four-day festival named after the game itself: Deyhontsigwa’ehs, which translates to “they bump hips” in Onondaga. Other names for lacrosse include tewaaraton (Mohawk) and baggataway (Algonquin groups). They’re here to celebrate “the Creator’s game,” which played an integral part in the Great Law of Peace that established the Haudenosaunee Confederacy more than 1,000 years ago. The declaration brought together the Mohawk, Oneida, Onondaga, Cayuga, Seneca, and later, the Tuscarora. The game uplifts Indigenous communities, and ceremonial medicine games are often held to heal the people. “This place is so small, but lacrosse is such a big part of the community,” Thompson says. 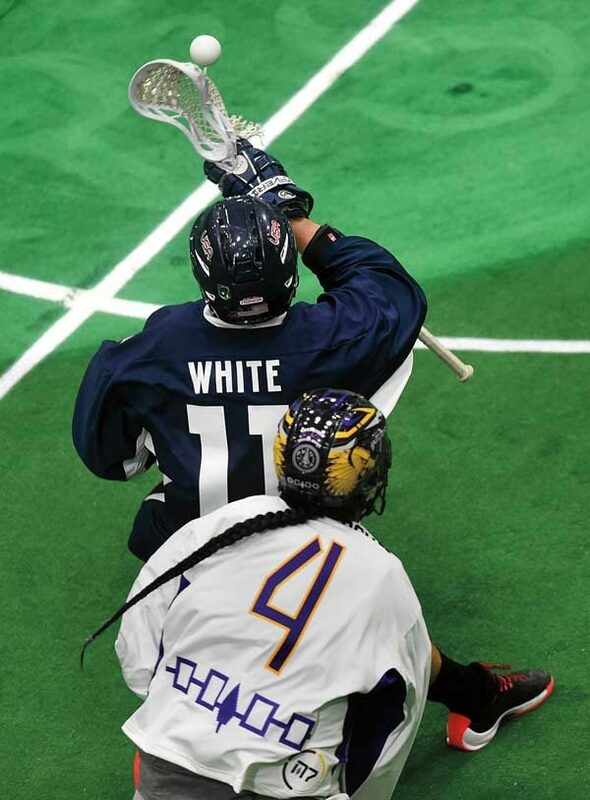 Lyle Thompson (4) of the Iroquois Nationals at the 2015 World Indoor Lacrosse Championship. When baby boys are born in Onondaga, a traditional wooden lacrosse stick is gently placed in the cradle. They learn to love the game, to cherish it, and to respect it. Then, one day, they’re buried with it — because more games are to be played with their ancestors and the Creator. One of those boys, inevitably born to play the sport, was Thompson — a professional lacrosse player and member of the Iroquois Nationals, where he plays alongside his three older brothers: Miles, Jeremy and Hiana. Lacrosse has been played by Indigenous Peoples for thousands of years, dating back to the 12th century. The game is considered a gift from the Creator, and as His favourite game, it was, and continues to be, played for His enjoyment. Long ago, lacrosse was played as far west as the Red River by the Ojibwa, south to the Seminole in what is now Florida, and stretching east to the Passamaquoddy in Maine. Hundreds of players would battle for the ball at one time on fields surpassing a kilometre in length, each giving thanks to the Creator for the gift of the game. Games would last for days. Even today, different nations play their own traditional versions of the game, where sticks come in various shapes and sizes, but the spiritual importance remains the same. “Keeping It Out” by artist Robert “Tim” Johnson. 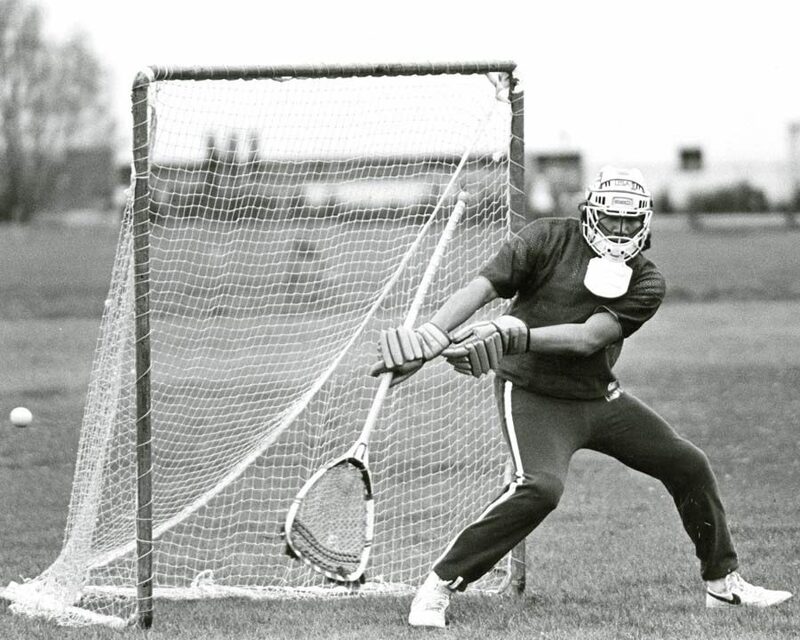 The birth of lacrosse is a tale that has been passed down orally since time immemorial. It started with a game, the Great Game, between four-legged animals and birds. Children growing up around the game hear this story from their Elders and coaches from the moment they pick up a lacrosse stick. On one side stood a bear, deer and turtle. On the other side, an eagle, hawk and owl. As the birds strategized on top of a tall tree, they noticed two smaller animals no larger than a feather creeping up from below. It was a squirrel and a mouse, both rejected from the other team because of their tiny size. They asked the birds if they could join them. The birds, at first unsure of how the small creatures might complement their trio, came up with an idea. They used the leather from a water drum, as the story goes, to transform the mouse into a bat, and together the birds stretched the squirrel until it became one that could soar through the air (resembling a flying squirrel). In the end, it was the bat that clinched the victory for the birds, never dropping the ball after its skills were realized. It’s a story that emphasizes how Indigenous people should treat other walks of life, and how they should respect others regardless of their size or skill set. In the late 1860s, Canadian dentist William George Beers aimed to “civilize” the rules of lacrosse and campaigned to have it named Canada’s national sport. The National Lacrosse Association (now Canadian Lacrosse Association) was founded in 1867 and at the onset banned Indigenous players from competing. Despite the impact European settlers and colonization have had on modern lacrosse, the traditional ways of the game remain intact. When Thompson picks up his stick, he believes that his style takes after the excellent vision of the hawk. It’s no surprise, then, that his traditional name is Deyhahsanoonedy, which means “he’s flying over us.” “We’re using plastic sticks now, but I still carry that same sacredness when I hold that plastic stick,” he says. This game is played for medicine; it’s played for our Creator. The Iroquois Nationals have continued this tradition. They are the only Indigenous nation in North America that competes in a sport internationally. When the team travels across borders, the players use their Haudenosaunee Confederacy passports. The team was founded by Faithkeeper Oren Lyons and accepted as a member of the Federation of International Lacrosse in 1988, and allows Indigenous athletes from other nations to play for them. Since then, they have earned four straight silver medals at the World Indoor Lacrosse Championship. The only thing missing was a medal at the World Lacrosse Championship — a tournament played on a large outdoor field. Their chance came in Denver in 2014. The Iroquois Nationals, with a roster that included the Thompson brothers and several other Indigenous lacrosse stars, believed they could win the tournament and reclaim the game as their own. In Denver, the team was met with fans and supporters from all over Indian Country. “It showed just how important the Iroquois Nationals are to not just our community, but all Native communities,” Thompson recalls. But despite their efforts to get past their two main rivals, Canada and the United States, the Iroquois Nationals came away with a bronze medal. Still, the world was reminded that the Iroquois Nationals are a force to be reckoned with. The Thompson name has since become a household name in the world of lacrosse. Thompson says that winning silver and gold at the World Lacrosse Championship is the next challenge. At the Deyhontsigwa’ehs celebration in Onondaga Nation, Indigenous youth from across North America travelled to meet their idols. Traditional singers with hand drums sang loudly under a nearby tent while dancers followed the rhythm. Halfway through the practice session, the sun broke through the grey clouds as young lacrosse players honoured the Creator with their play. In the end, they gathered around Thompson, looking up in admiration and hanging on every word he spoke.